Local history note on Sir Richard Burton and Lady Isabel Burton. 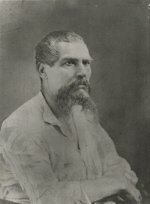 Sir Richard Burton was born in Herefordshire on 19 March 1821, the son of Colonel Joseph Burton and his wife Martha Baker. Martha’s eldest sister, Sarah, later married Joseph’s youngest brother, Francis. Two more children were born – a daughter Maria and a son, Edward - before, in 1826, the family moved to France where they settled in Tours. The children were taught by tutors and Richard learnt Latin and Greek as well as becoming fluent in French. In 1832 Colonel Burton brought them back to England, where, on the advice of an old friend, he enrolled his sons in a school in Richmond run by Reverand. Charles Delafosse who was the chaplain to the Duke of Cumberland. The Richmond Academy, run since 1764 by the Delafosse family, was situated in a mansion at the corner of the Little Green and Duke Street. The Burtons took a house in Maids of Honour Row, just across the Green from the school. A year later the school was temporarily closed after an outbreak of measles during which several boys died. This prompted Colonel Burton to take the family back to France where they settled in Blois, 40 miles from their previous home in Tours. Once again the children had private tutors. Both Richard and Edward were determined not to enter the church that they decided to get themselves rusticated (sent down) from their respective colleges. Richard succeeded in the spring of 1842 when he had missed an arranged lecture to attend an off limits steeplechase. An interview followed at which Richard accused the university of treating the undergraduates like schoolboys. His fellow culprits were sent down for the rest of the term, but Richard was recommended not to return to complete his education. Richard could now realise his ambition to join the army. The first Afghan War was still unfinished when he sailed for India on 18 June 1842. He landed at Bombay on 28th October and was posted as an ensign to the 18th Regiment of the Bombay native infantry. Within a year he had become the regimental interpreter, having passed examinations in Hindustani and Gujerati. He then became proficient in 4 other languages and also studied Sanskrit and Pushtu as well as increasing his knowledge of Arabic.